For anyone reading this in sunnier climes, in the UK it has rained and rained and rained. Other countries have their rainy seasons but our monsoon season always comes as a complete surprise. Even the most determined gardeners have had their endeavours thwarted by perpetual rain. Food producers have lost their crops on flooded land. God forbid, we’re all set for a scarcity of potato crisps in the months ahead! Whatever happens, food is bound to cost us more. I’d been waiting for a dry sunny day to go and harvest the fruit on my allotment. Despite my lack of horticultural effort this year, I have been rewarded with a fair amount of produce. The berries would no doubt have benefited from a bit more sun, or any sun, but a few days ago I was still able to pick strawberries, raspberries, white, pink, red and black currants, gooseberries and even a handful of alpine strawberries. The currants were tedious to pick and the red ones turned mouldy in an instant, before I had time to get them in the pan. So sad as they are such a glorious fruit. There are still more white currants to harvest as patience got the better of me after stripping 5 bushes. This is my first year of any kind of crop as the bushes were planted just a few years ago. The pink currants are particularly beautiful and as this is my first opportunity to preserve them I was curious to see whether their marvellous colour would follow through in a jam. They are a variety called Gloire de Sablon. I made the simplest jam with them, just berries, sugar and water, pushed through a food mill to remove the seeds, but not dripped in a jelly bag which would have given a clearer result. The jam has the look of a jelly but with just a tad more texture, a bright tangy flavour and will be eaten with relish on toast for breakfast. All currants contain plenty of pectin, the stuff you need to help jam set, so achieving a firm set shouldn’t be a problem. Place all the ingredients in a pan and bring slowly to a simmer, stirring all the time until the sugar has dissolved. Simmer for 5-10 minutes until the currants are cooked and burst. Take the pan off the heat, pour the contents into a bowl and leave covered overnight. 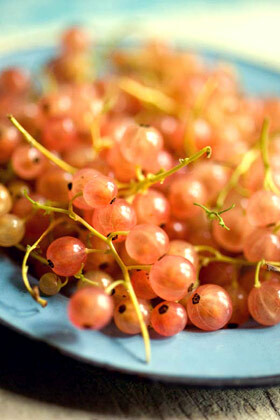 Next day push the currants and syrup through a sieve or food mill, collecting the juice and puree in a bowl underneath. 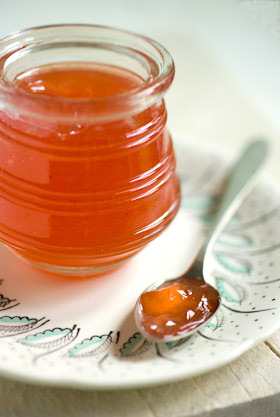 Prepare your jars by sterilising them and their lids in a warm oven for 15 minutes or alternatively prepare a water bath, preserving jars and seals, if you plan to process (can) your jam. Place the puree and syrup in a preserving pan, bring to a rolling boil and maintain to setting point, which should only take around 5-10 minutes. Skim to remove any froth from the edges of the pan, then pour into hot jars and seal. Alternatively, pour into hot preserving jars, seal and water process for 5 minutes. Remove from the water bath and leave to cool for 24 hours before testing the seals. Beautiful! Your jam looks wonderful, do they have a milder flavour than blackcurrants? I’ve never tried pink or whitecurrants! You inspire me. I have cherries and 6 pints of handpicked raspberries waiting for me, but haven’t drummed up the energy to get them into jars. Must get onto that! My husband just sent your blog to me! It’s wonderful and inspires me. I love the name and the beautiful pictures, especially the ones in the headings! You write of the rain you’re having this summer . . . oh, for some of that rain and relief from the heat!!! We are in the USA midwest and have been suffering, but not as badly as others around us. Last year I planted three dried rhubarb roots. One is now about 10″ tall, the second about 1″ tall and the third has not appeared. They do not like the temperatures, of course. I provide shade for them most of the time but they are not happy . . . I look forward to next year and pray they survive this summer. The real reason my husband forwarded your information is to show me what rhubarb looks like because he is convinced our plants are something else! He KNOWS he’s right and I KNOW I’m right!!! (I’ve always told him that I married him because I thought he knew everything.) . . . This is a game we play . . . so we’ll wait and see! Thank you for your lovely pictures and interesting, informative information. That is one gorgeous jelly. I’m sorry about your rain. I wish I could take some of it for you, because we are in the midst of a brutally dry heat wave, and everything wants water. Isn’t that how it is? Still, I’m making lots of good stuff–my currants were very few again this year–but picked up some black currants and made some outrageous jam with them. I do love currants!